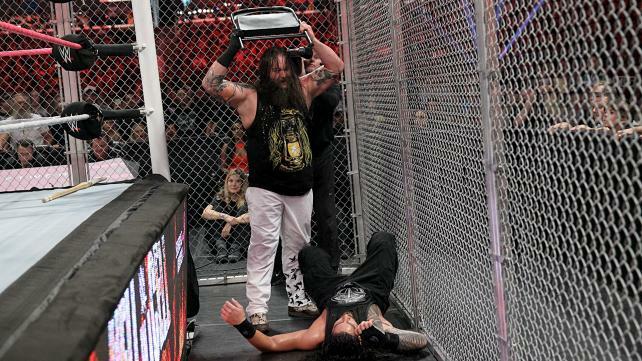 WWE Hell in a Cell 2015 is out on DVD and Blu-Ray now in the UK. You can order here at WWEDVD.co.uk and all other reputable Home Video stockists. Broadcast live on PPV (and on the WWE Network) from the Staples Center in Los Angeles, California, USA on 25th October 2015. 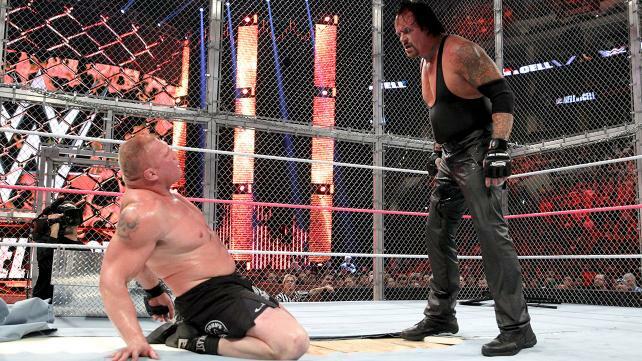 The show features Brock Lesnar and The Undertaker battling in Hell in a Cell in the main event. There's also six other matches featuring the likes of Kevin Owens, Seth Rollins, The Dudley Boyz, The New Day, Kane and Bray Wyatt in action. There's two extra matches included on the Special Features of the Blu-Ray release. The opener is a disappointing contest between the returning Alberto Del Rio and John Cena over the United States Championship. The two seem to struggle to connect within the ring, in a surprisingly short match that is lost without the surprise factor of Del Rio's return alongside Zeb Colter. The first of two Hell in a Cell matches on the show, see's Roman Reigns and Bray Wyatt conclude their lengthy rivalry and look to cement themselves as major players for the company. The match is full of big weapon-based spots and near falls in front of a loud Los Angeles crowd. Whilst the match goes a little too long and the finish struggles to match the action that had gone before it, this was still both men continuing to prove their credentials on the big stage. The New Day are without Xavier Woods for their WWE Tag Team Championship match against The Dudley Boyz, leading to an entertaining pre-match promo. The match itself is a little bit sloppy in places, but does containing a handful of good action sequences. Nikki Bella's rematch for the WWE Diva's Championship against Charlotte is based on sound storytelling, with a great narrative throughout. Had a couple of moments of sloppiness been avoided and the bigger spots of the match had come through then this would have been even better. Kane and Seth Rollins battling over the WWE World Heavyweight Championship is a surprisingly entertaining contest with plenty of entertaining action. However, it's not a standout in Rollins' long title and includes an anti-climactic finish. Ryback's chance to win the WWE Intercontinental Championship back from Kevin Owens ends up being a short, nothing kind-of bout. The main event match between The Undertaker and Brock Lesnar is a brutal Hell in a Cell contest as the two settle their long feud. A bloody brawl around the structure, the pair produce some great near falls and have the Staples Center eating out of the palm of their MMA gloved hands. Perhaps the best example of a Hell in a Cell bout since WWE went PG in 2008. 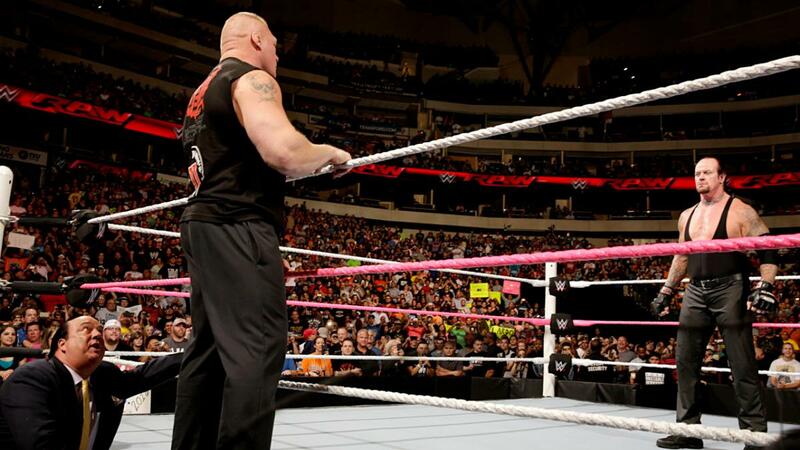 The show concludes with a surprise angle to build towards the next PPV, Survivor Series. Rusev, King Barrett & Sheamus team up against Cesaro, Neville & Dolph Ziggler for a fun six man tag team match from Hell in a Cell 2015 Kick-Off. Cesaro puts in a star-like performance, and is rewarded with a loud crowd reaction for pretty much everything he does in the ring. Kane's job evaluation from Monday Night RAW #1166 (28th September 2015, Buffalo, New York, USA) is a strange segment that see's a number of twists and turns throughout. Whilst the opening is a little goofy, by the end it's difficult not to be drawn in to the Kane vs. Rollins storyline. A slick promo from Bray Wyatt from Thursday Night Smackdown #841 (1st October 2015, Albany, New York, USA) concludes in a slightly awkward stare down with Roman Reigns with the challenge being issued for Hell in a Cell. From Monday Night RAW #1168 (12th October 2015, Chicago, Illinois, USA) Kane and Seth Rollins have an enjoyable Lumberjack match, with plenty of outside involvement. 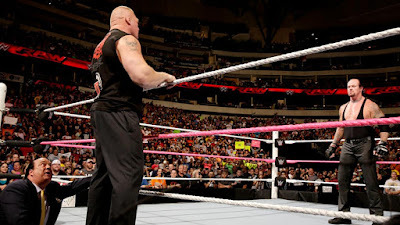 A brilliant segment between Brock Lesnar and The Undertaker from Monday Night RAW #1169 (19th October 2015, Dallas, Texas, USA) opened by "Stone Cold" Steve Austin, leads into the pairs Hell in a Cell match perfectly with both Undertaker and Paul Heyman putting in great performances on the microphone. Despite a few misses on the show (John Cena's Open Challenge in particular) this is a strong offering from WWE. The two Hell in a Cell matches includes are both a strong watch, with The Undertaker and Brock Lesnar's brutul outing edging thanks to the veteran's pacing the match much better than their younger colleagues. The contest over the WWE Diva's and WWE World Heavyweight Championship are also good matches and worthy of a viewing. The special features are also strong with two more than watchable matches included, as well as Undertaker and Brock Lesnar's showdown from Monday Night RAW #1169, which may very well be the best piece of work included on the whole disc.